As released on Tuesday May 31 - Each NRL Team for Round 13 is listed below. NOT The Footy Show Podcast Episode 65 - June 2, 2011. PAR: Hayne, Burt, Morgan, Loko, Atkins, McGuire, Robson, Mannah, Keating, MoiMoi, Hindmarsh (c), Lasalo, Smith. Bench: Shackleton, Allgood, Webb, Horo. STI: Boyd, Tagive, Gasnier, Cooper, Nightingale, Soward, Hornby (c), Hunt, Young, Weyman, Scott, Creagh, Prior. Bench: Green, Fien, Cuthbertson, Merrin, Bosden, Rein. CRO: Gordon, M Wright, Pomeroy, Best, Mills, Graham, Porter, Snowden, Morris, Tautai, Bukuya, Tupou, Gallen (c). Bench: Vave, Mannah, Flanagan, B Wright, Frizell. BRI: Hoffman, Copley, Reed, Beale, Yow Yeh, Lockyer (c), Wallace, Hannant, McCullough, Anderson, Glenn, Thaiday, Parker (c). Bench: Baptiste, Carlaw, Dodds, Hala. GLD: Campbell, Michaels, Tonga, Thompson, Mead, Zillman, Prince (c), Bailey, Srama, Henderson, Bird, Minichiello, Harrison. Bench: White, James, Tagataese, O'Dwyer, Ridge, Toopi. PEN: Coote, Simmons, Jennings, Tighe, Purtell, Burns, Walsh, McKendry, Kingston, Civoniceva (c), Waterhouse, Smith, Lewis. Bench: Grant, Bell, Fatiaki, Weston, Iosefa. Note: The order in which Special Fried Rice is chosen rotates - this week Waz had 1st choice, Matt 2nd, Dave 3rd and Nic 4th. Here on www.wdnicolson.com we've got all the Game Results, Match Reports, Game Highlights, Game Stats, Injury News and NRL Tweet Player of the Year Award Votes in the one place. This Round Review also integrates our NRL Injured List - which if you haven't bookmarked by now - I suggest you do so. Player of the Year Votes are added as awarded by our panel - all votes are usually up to date by Tuesday. 7:05pm (Local) 27 May @ Suncorp Stadium, Brisbane. NRLTweet Game Summary: What happened at half-time at Suncorp? Brisbane lead Manly 10-4 at the break but are run down deluxe. Manly 34-10 victors by full-time. Outstanding display. It really struck home home good he is when you consider he is the senior halves partner in only his second full season, after playing alongside a rookie last year as well. His banana kick for Brett Stewart was reminiscent of Andrew Johns. Probably deserves the 3 points for THAT pass alone. His performance in this game typified what he means to the Manly side and why they need him on the field. Imagine what he will be able to do with some match fitness. Really coming in to his own in first grade. Great support play. Had a barnstorming game (Like he always seems to do against the Broncos) One the forward battle for Manly which gave Foran & DCE plenty of room th weave their magic. Is Class with a Capital C - Very controlled 1st half and then blew the Broncos away in the 2nd. The QLD halfback stocks look in good hands for a while yet. The Broncos sent a lot of defence his way and he didn't back away from the challenge. Support play was good too. Welcome to Season 2011... after an off-season that often feels longer (or shorter - depends if you like cricket or not) than it is - the footy is back. Here on www.wdnicolson.com we've got all the Tuesday Team News, Wednesday Previews and Friday Late Mail (sourced from SMH and beyond) that will keep your Tipping and Fantasy habit well fed. This preview integrates our NRL Injured List - which if you haven't bookmarked by now - I suggest you do so. 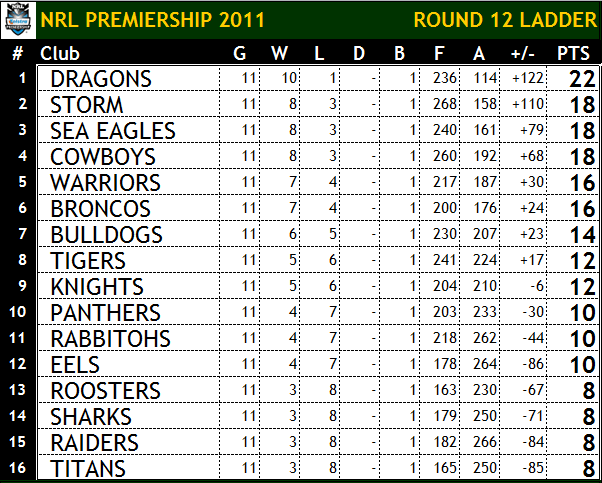 SEA EAGLES 3rd TEAM RECORD 7-3 for 16 Points, +55. BRONCOS 6th TEAM RECORD 7-3 for 16 Points, +48. MAN: B Stewart, D Williams, Lyon (c), Matai, Hopoate, K Foran, Cherry-Evans, King (c), Ballin, Kite, Watmough, Galuvao, G Stewart. Bench: Mauro, Buhrer, Rose, T Williams, Robinson, Oldfield. BRI: Beale, Gagai, Copley, Reed, Moylan/Yow Yeh, Norman, Wallace, Dodds/Hannant, McCullough, Kenny, Te'o, Glenn, Parker (c). Bench: Baptiste, Lui, Anderson, Dodds, Hala, Carlaw. Manly are going very nicely right now and getting Brett Stewart back in a team that is hardly touched by the Origin backup factor makes them hard to tip against. Brisbane will likely rest Lockyer and Thaiday so I'll pick Manly. SMH + Other Late Mail 27/05 - Hannant should play, Lockyer and Thaiday will not. Dane Carlaw will miss out. Des Hasler says Jason King may in fact play, as will Brett Stewart. SEA EAGLES To Win By 10 Points.